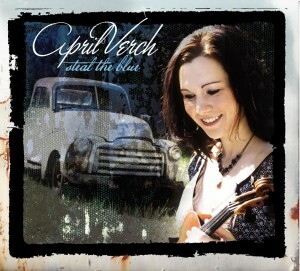 “I’m not going to tell you how good April Verch is-the music on Steal The Blue makes doing so unnecessary. But I will say that this collection is not only compelling proof of her continuing development, but also the best portrait yet of April as a performing artist. It was my pleasure to be a member of April’s band for nearly three years, joining shortly after the issue of From Where I Stand (2004) and leaving (regretfully) not long after Take Me Back (2006) was released. During the last year or so, April built a set list around songs from the latter, and we were struck by the difficulty of translating some of them from their full arrangements into the sparser sound of the stage show. So when the topic of another project was broached, I argued as forcefully as I knew how for an approach that would reflect the band’s natural sound-one that I had seen bring audiences around the continent to their feet time after time. At the same time, April’s desire to take her singing to a new and higher level had led her to extensive consultation with Stephen Mougin, who had filled in with the band on a couple of memorable dates in early 2006. In the end, we decided to collaborate on the next album- the one you hold in your hands.